Nancy Haynes couldn’t help recalling her physics class in high school as she watched her kindergarten-age son sliding a lunch tray, then a carpet tile down a snowy hill. He slid the piece of carpet down the snowy hill first with its smoother bottom side down, next with the carpeting side down. She saw his face light up with understanding. Haynes is the executive director at the Fair Housing Center of West Michigan. With three sons in the Grand Rapids Public Schools system, the very best in school options were at the top of her priority list. The magic Haynes witnessed was a combination of teaching techniques that allows students to apply what they learn in a practical manner. Topics are woven into all manner of subjects—math, reading, science, art—while taking advantage of every opportunity to apply that learning to life experiences. “You won’t ever hear my kids say, ‘I’ll never use this in real life,’” Haynes says. She tells a story about how her son studied food-related issues in his science class, followed by a field trip to a farmers market. Because of her work at the Fair Housing Center, an organization that strives to ensure housing opportunities are open to all on an equal basis, Haynes is keenly aware of parents in the district making choices about where they live based in great part on the available options in schools. Omar Cuevas, an assistant vice president at Fifth Third Bank, refers to his six children as the Brady Bunch. The two boys and four girls have been enrolled in Grand Rapids Public Schools from the beginning, and this year, two of his children are seniors. He also parents a junior, a sophomore, a freshman, and still has one in 8th grade at C. A. Frost. Cuevas says he had options open to him, options to enroll his children in other schools, but he’s committed to GRPS because he feels that GRPS is committed to his children. He’s watched the changes over the years, the downs and now the ups, and he believes in the improvements he is seeing. He has nothing but praise for the new leadership, beginning with Superintendent Teresa Weatherall Neal. 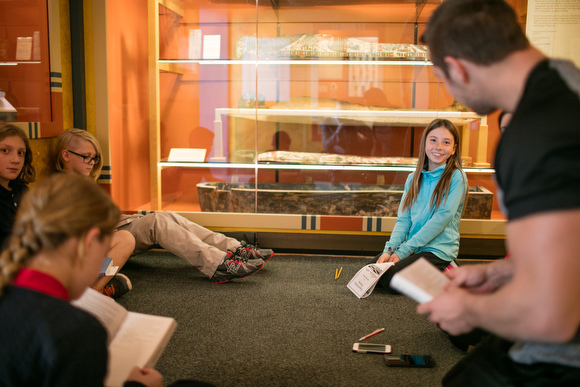 Arguably one of the most groundbreaking innovations in education GRPS offers is the collaboration between school and city that resulted in the Grand Rapids Public Museum School, which opened its doors to students in September. It was a collaboration that brought an unprecedented number of partners to the table: Grand Rapids Public Museum, Grand Rapids Public Schools, Kendall College of Art and Design of Ferris State University (KCAD), Grand Valley State University (GVSU), the City of Grand Rapids, and Downtown Grand Rapids, Inc. (DGRI). The Museum School is located at 54 Jefferson Street, site of the original public museum. 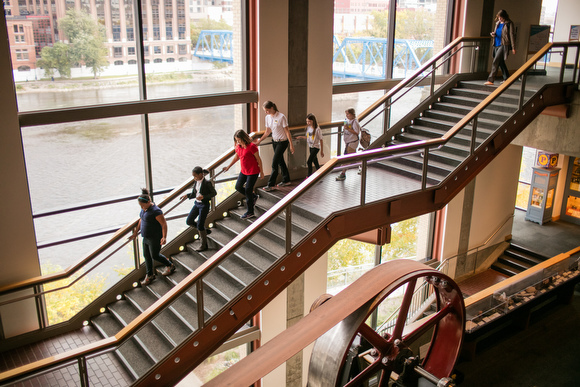 As a Grand Rapids Public Schools Center of Innovation, the Grand Rapids Public Museum School will serve grades 6 through 12, starting with 6th grade during the current school year, then adding a grade each year until complete. 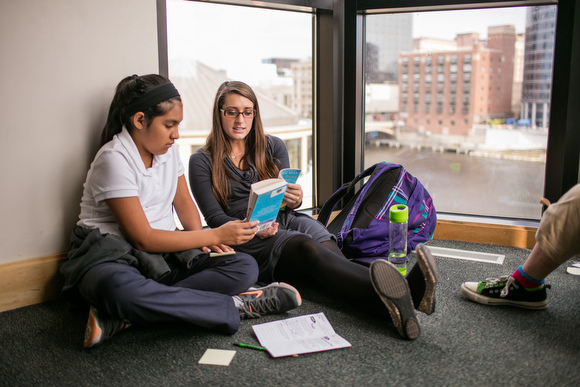 Grades 6 through 8 will be housed at the Van Andel Museum Center building and grades 9 through 12 will be housed at 54 Jefferson. 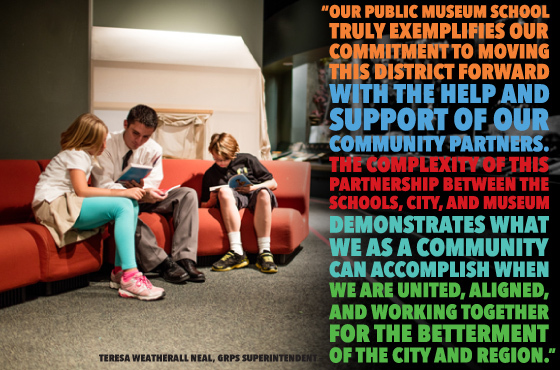 “The Museum School embodies the three core principles of the GRPS Transformation Plan: investing for growth, recruiting/retaining top talent, and restoring stability to the system,” says Superintendent Weatherall Neal. Weatherall Neal welcomed Christopher Hanks to the new school as its principal. Formerly an assistant professor in Grand Valley State University’s Undergraduate Foundations of Education Program, Hanks greeted 60 6th-grade students to the new school in September. Hanks talks about an important connection the Museum School is making between the academic and the environment around them. It’s called design thinking, a systematic way for students to approach real-world problems and encourage as many solutions to those problems as possible by tapping into their creativity. Place-based education immerses students in their local culture and heritage, the resources and community all around them and relating it back to math, science, art, social sciences and language arts. The city becomes an extended classroom. “We want the students to be hands-on, ears-on, eyes-on, fully engaged,” says Hanks. Another unique and popular theme school is the Zoo School, located at the John Ball Zoological Garden. Previously a one-year program for 6th grade, the Zoo School will be offering a 6th- to 8th-grade option. Students learn in the natural environment of the zoo while incorporating a core curriculum of math, science, art, reading and social studies. The Zoo School offers special units on astronomy, zoology, forestry, chemistry, and physics for gifted students. At GRPS’ Innovation Central High School, four academies offer students career-focused education with opportunities to try their hand at a variety of careers by job shadowing and interning with business and higher education professionals. Students might even get to swing a hammer. The four academies include the Academy of Design & Construction, the Academy of Business, Leadership & Entrepreneurship, the Academy of Health Science & Technology and the Academy of Modern Engineering. Some of these prepare students to go on to higher education, while others prepare them for trade schools or certification. Craig Datema, chair and CEO of Triangle Associates, Inc., has been involved with the Academy of Design & Construction from the ground up, developing curriculum, creating venues for field trips, and organizing fundraisers. He has served as chair on the academy’s advisory council since 2009. Triangle mentors students one-on-one, developing relationships between students and trades people. Students visit construction sites and participate in workshops, learning about career opportunities they might not have otherwise considered. Other participants in the academies from the business community include Rockford Construction, Amway Corporation, Huntington Bank, Grand Rapids Area Chamber of Commerce, Warner Norcross & Judd, LLP, Michigan State University’s College of Human Medicine, Grand Valley State University, Western Michigan University, Grand Rapids Community College, Spectrum Health and others. GRPS is Michigan’s fifth largest public school district and offers the largest selection of school choices in West Michigan. Neighborhood schools offer traditional education. Theme schools offer experiential education in unique surroundings. Centers of Innovation offer students a career-based curriculum that connects them to community business leaders. GRPS also provides center-based special education programs and services to students from 20 school districts. The Museum School partners with other area institutions like GVSU's school of Ed for join programming.With so many choices in schools and approaches to learning, GRPS is contributing to the growing vitality of the city of Grand Rapids, attracting families to move to the city for the first time or to return. “Grand Rapids has the fastest growing downtown population in the State of Michigan, and the Grand Rapids Public School system is evolving to meet this demand,” says Jon Rooks, owner of Parkland Properties, a real estate company in Grand Rapids with a focus on urban and waterfront properties. Statistics back up Rooks’ expectations. Of the 60 slots for incoming 6th graders to the Museum School, more than 200 students applied, 25 percent of which were out-of-district applicants. This special report was made possible with support from Grand Rapids Public Schools. Zinta Aistars is creative director for Z Word, LLC. She also hosts the weekly radio show about books and writers, Between the Lines, at WMUK 102.1 FM. Rapid Growth: Since implementing the Transformation Plan, GRPS has focused on diversifying school choices to meet customer wants. Why is it important to diversify school choices? What are parents looking for in their schools? Tom Almonte: Parents want their children to have the best education available. GRPS theme schools provide parents with a unique opportunity to send their children to a school that provides the same level of education as other highly desirable educational institutions in the region, while providing a rich and diverse environment. Parents, regardless of their background, understand that in order for our children to be competitive when they enter the workforce, education alone will not allow them to thrive. They must be able to maneuver with ease in a diverse environment. RG: With the opening of the Museum School, GRPS brought an unprecedented number of partners to the table, including GVSU, DGRI, KCAD, DDA, City of GR, Museum Foundation, to create unique place-based curriculum using the city as a classroom and incorporating design thinking. Why did the city feel it necessary to be involved? Almonte: The City understands that a thriving community must include a sustainable Grand Rapids Public School. The Museum School is another vital piece in GRPS’ transformation plan. A school in downtown will enhance the growth and sustainability of Downtown Grand Rapids. The transformation of the City is closely linked to the transformation of GRPS. The leadership of both organizations are keenly aware and are committed to our transformation efforts. RG: And what did the Museum School offer that you wanted for your children? What about a place-based curriculum did you feel is beneficial to the education of your children? What benefits the children in using the city as a classroom? Almonte: As many parents, my wife and I are invested in the education of our children. Providing a diverse environment in which they become critical thinkers, while using their surroundings, and working within a team is important to us. We believe that using their environment as a classroom is very important in providing our children with the ability to work on a theory, test it, and understand the impact within their community. As an educator, my wife supports this approach. As parents, we are delighted that this option is provided by GRPS. In our opinion, the Museum School provides our daughter, Sophia with a rich classroom experience. Our desire is that our children become critical thinkers within a diverse environment. RG: Of the 60 slots for incoming 6th graders at the Museum School, 200+ applied, and 25 percent were out-of-district applicants, allowing the district to grow by attracting out-of-district families as well as serve current families who want more options. Is this growth important—and why—to the city? For you as a parent? Almonte: The growth from parents outside the district reflects growing trust from parents. I noticed that in different circles where GRPS was not part of the conversation, parents are beginning to discuss GRPS Theme Schools as a viable option for their families. As many parents, we are committed to providing our children with the best education possible within a diverse environment. Creating creative and critical thinkers who can thrive within a diverse environment is the goal for our children. GRPS Theme Schools provide such an environment. GRPS’s transformation has changed our view of the Grand Rapids Public Schools as an institution.